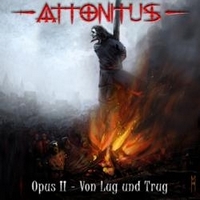 This is the new album from German folk music group Attonitus. They are a little misplaced here with the heavy metal products, because they concentrate their music on flute, bagpipe, folk singing, and the subjects of their lyrics are about the victims of lies and deception in the Medieval times. 14 songs that each tell a little story of deception, but the musical content gets boring. Even though the band Attonitus appears on several Medieval festival with their music, this kind of sound don't appeal to the general masses of heavy metal listeners. But fair enough that Black Bards distribute their music, and with their special style gets their very own fans. All of their music is as mentioned guitar, bagpipe and flute, but as metal music you will find it strange and boring.